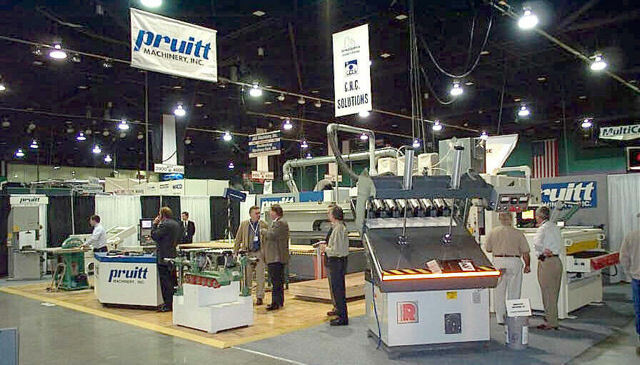 Pruitt Machinery was established in 1971 by Howard Pruitt to distribute new machinery to the woodworking industry in western North Carolina. Later, we began importing from England, Germany, Japan, and Italy. As business increased, we became a source for second-hand machines by trading used equipment and reselling it. 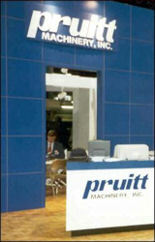 We established a reputation as a supplier of reconditioned and rebuilt machines all over the United States and other countries. Changes in the woodworking industry allowed diversification into plastics and non-ferrous metals. Our goal is to provide machinery solutions which best meet the needs of our valued customers. Our experienced sales staff for new and used machinery, supported by technicians and parts department, is second to none. Our display at a trade show.